No one comments, no one calls.....what's up with you people? I'm glad I'm not Larry today - he has to go to the dentist. Then again, Larry doesn't have to amuse a 4-year-old all day. Maybe he is the lucky one. This may be my shortest blog post ever. Do you realize I've blogged about toothpaste, floor sweepers, laundry detergent, toasters, and dish-drying racks this week? Domesticity unleashed! I didn't even realize I had a theme. Halloween's coming. At what point can I reasonably buy a huge bag of candy under the pretense of saving it for the 31st? I hear some Hot Tamales calling my name. Darn! I hit the enter button by mistake, and now I am being haunted by the superfluous "8" once more. Click on that Halloween link in #6 so you don't make the mistake of taking your innocent young children to Michael's this month. Forewarned is forearmed. 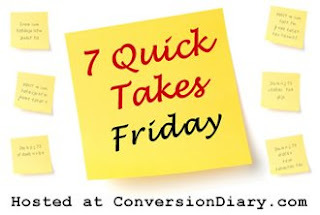 Conversion Diary has more 7 Quick Takes - she's good with computers, so she never suffers from a superfluous "8." Or "9." I'm saying October 1st on candy - as long as we are in the same month, it's all good. And Michael's . . . my husband has instilled a love of all things Halloween into our children - my 2.5-year-old stands infront of the headless bride and screams back at her. Good luck with the 4-year-old . . . the dentist may not be the most fun, but it doesn't involve 18 trips to the potty, a PB & J without the crusts, Lego's dropped down the heating grates, and 1 adult contemplating the ramifications of sporking my ears out to avoid hearing the question, "Why?" for the 11,437th time. Or is that just at my house? We love Halloween around here! Plus it's JMac's birthday :-) All the kids can't wait for our annual "Halloween Movie Night" as well as the annual "Halloween House Walk". Hmmm... if you write up all seven of your takes first, highlight, and then choose the numbering option, it will number everything all nice and neat for you... Or just backspace to get the eight off. No comments, huh? Here's one: who did those dots for you up there? I really love them. Are you still unhappy with your brown sides, b/c I still worry about your happiness on that issue. Seriously, get an idea of what you'd rather have there and I'll fix it for you. I loathe taking my kids to any store because they're past Halloween already--they see the Christmas decoration displays up and they're ready to make wish lists for Santa--screw free candy from the neighbors and dressing up! October is my nemesis. I spend all month wondering how I'm going to fail (once again) in the creativity department come Halloween. I *wish* I wanted the tamales. All snickers fun size all the time. I want them now. We were supposed to wait to buy candy? I only bought tootsie rolls for throwing out at the parade in Leesburg. No one comes to our house (too out of the way, too dark, no sidewalks). Just found your blog. I think we both love The Egg and I. Have you read all Betty's books? Including Mrs. Piggle Wiggle? Plus, I love Hot Tamales. Please don't tell me you're giving up on that new dishwasher. I've been without one for a year now and it's at the top of my list of things to get after the gazillion in debt is gone. But don't give up! Yes, it's comforting to know there are other water logged pruned up hands out there mumbling over the dirty dishes with me - But someday, we'll have our little shiney, non-whiney, quiet kitchen helpers there awaiting our food chunked plates. Let's just hope it happens before the wee ones leave the nest. Don't lose hope!